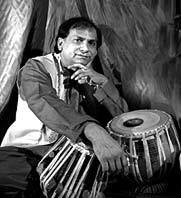 An original member of the Diga Rhythm Band, which included tabla master Zakir Hussain and Grateful Dead percussionist Mickey Hart, Arshad Syed also performs with the Zakir Hussain Rhythm Experience, and as an accompanist with top classical Indian music artists such as Ustad Sultan Khan and Pandit Habib Khan. He is also known for his skill with light classical and folk rhythms. A very melodic percussionist, in the second half of his musical career he has focused on the Indian santoor, a stringed instrument indigenous to the Kashmir valley. The santoor is made of maple or walnut wood, shaped like a trapezoid, and the strings are steel and are played with a pair of curved mallets made of walnut wood. Arshad Syed is a disciple of the great santoor maestro Pandit Shiv Kumar Sharma. Arshad Syed teaches tabla and santur in Fremont and Berkeley, California. Arshad Syed interview. Full story at nbc.com. Guitar-Sitar Jugalbandi with Matthew Montfort, Pandit Habib Khan and Arshad Syed.